Achondroplasia is a Greek word meaning “without cartilage formation”. “A” is for negative, “chondros” for cartilage and “plasia” for growth. It´s caused by a genetic mutation resulting in the inability to convert cartilage to bone. Although we are speaking of bones growth, the central problem is in the cartilage. But now, I will start by describing ossification, that is the process of bone formation. In the fetus, most of the skeleton is made up of cartilage, a tough, flexible connective tissue that has no minerals or salts. As the fetus grows, the bone cells: osteoblasts and osteoclasts, slowly replace cartilage cells and ossification begins. The different between both rests on whether a cartilage model serves as the precursor of the bone (endochondral ossification) or whether the bone is formed by a simpler method, without the intervention of a cartilage precursor (intramembranous ossification). The bones of the extremities and those parts of the axial skeleton that bear weight (e.g., vertebrae) develop by endochondral ossification. The flat bones of the skull and face, the mandible, and the clavicle develop by intamembranous ossification. The separate labels for types of bone or bone tissue should not be taken to mean existing bone is either membrane bone or endochondral bone – these names refer only to the mechanism by which a bone is initially formed. Due to remodeling of bone that occurs later in development, the initial bone tissue that was laid down by endochondral formation or by intramembranous formation is soon replaced. The replacement of bone is established on the preexisting bone by appositional growth and is identical in both cases. Long bones, although classified as forming by endochondral formation, their continued growth involves the histogenesis of the endochondral bone and the histogenesis of intramembranous bone, with the later occurring through the activity of the periosteal (membrane) tissue. 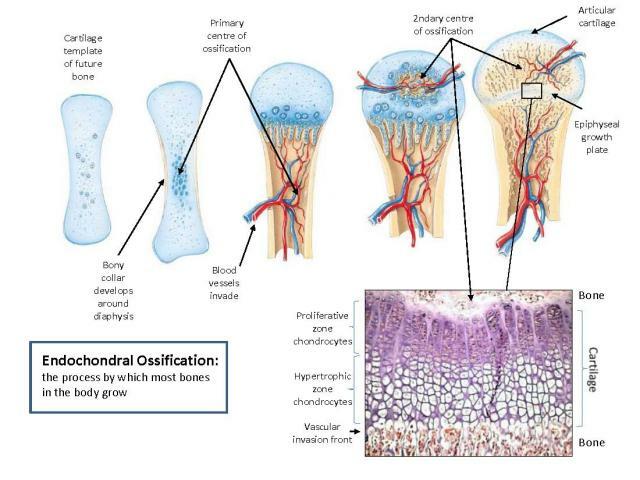 The first evidence of intramembranous ossification occurs around the 8th week of gestation in the human with a condensation of mesenchymal cells within the mesenchymal tissue.This is the membrane referred to in the term “intramembranous” ossification. Long bones have epiphyseal plate, also known by physis or growth plate. Is a hyaline cartilage plate in the metaphysis at each end of a long bone. 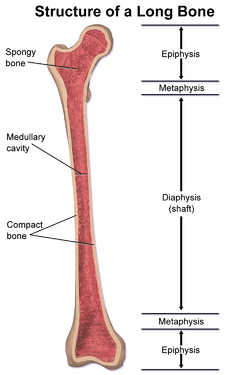 The metaphysis is the wide portion of a long bone between the epiphysis and the narrow diaphysis. It is considered a part of the growth plate, the part of the bone that grows during childhood and as it grows, it ossifies near the diaphysis and the epiphyses. For ossification to occur it is vital the activity of osteoblasts and osteoclasts and the addition of minerals and salts. Calcium compounds must be present for ossification to take place. Osteoblasts do not make these minerals, but must take them from the blood and deposit them in the bone. By the time we are born, many of the bones have been at least partly ossified. As growth proceeds, the thickness of the epiphyseal plates gradually decreases and this bone lengthening process ends. In humans, different bones stop lengthening at different ages, but ossification is fully complete by about age 25.